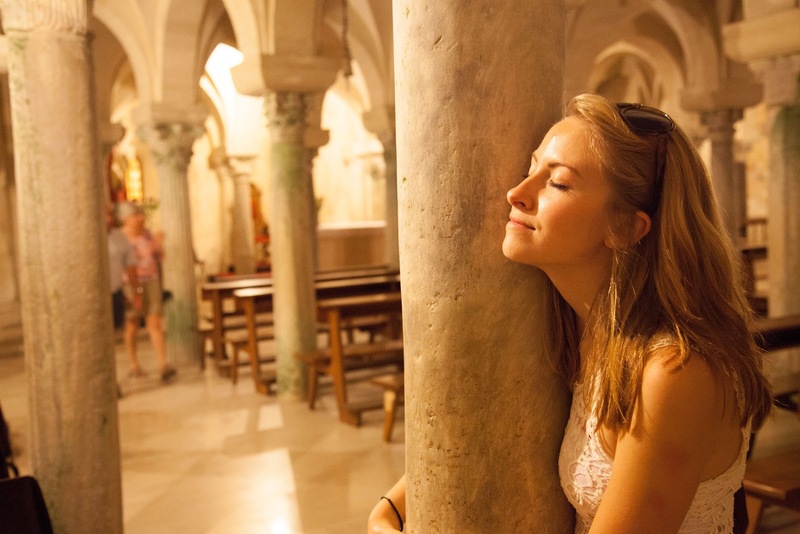 Living in Italy and visiting Italy are really very different. Which is why I still get that same feeling of nostalgia when I look back at old photos from Italian holidays pre-moving here. 1) The top photo shows me and my friend Fiona having an early aperitivo in a park in Parma. It was August 3rd 2011 and my baby 19 year old self was about to get a train on her own (a Frecciabianca which was ridiculously difficult to lug my huge suitcase onto) from Parma to Milan to meet Magro for the second time ever. After meeting on holiday in America, I took up his offer of staying with him in Milan for a while if I "ever happened to pass through Italy" (I tried so hard to seem casual about this) pretty much straight away and we met again on this day, two months after we'd last seen each other. The wine in the park was an attempt to calm my nerves and I think it worked but by the time we rolled in Milano Centrale it had worn off. 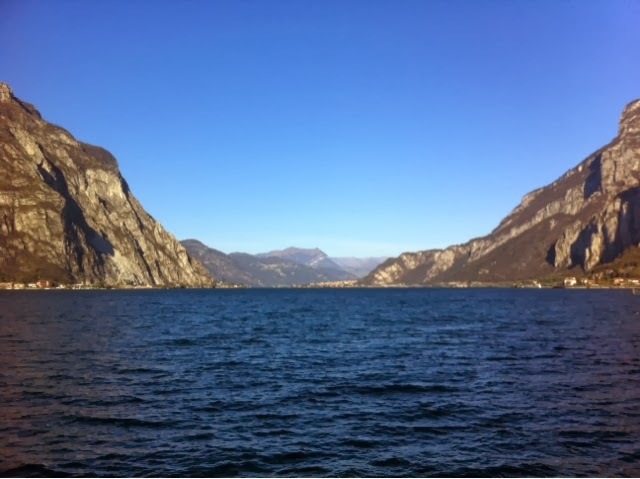 2) Lake Como from the shores of Lecco. When I came to visit my workplace for the first time, the meeting was over in 20 minutes and I had the whole day to kill. They'd suggested I go to Lecco at some point so I thought why not today? I bought a ticket as soon as I got back to Monza train station and spent a lovely few hours studying Manzoni's Promessi Sposi by the lake, eating a piadina and then an ice cream from Grom. I can't wait to get down there and see it all again although I'll probably die from heat. I'll pop pictures up and a web contact too in case anyone fancies a week in Puglia over the summer. 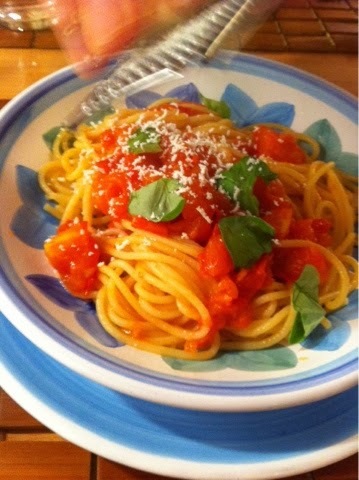 4) The most Italian dish, garlicky tomato pasta with basil and cheese (ricotta salata here) yum yum yum. I wish I ate this every day but I don't. My dream menu would be scrambled eggs followed by natural yoghurt and fruit compote and berries and passion fruit for breakfast, with a piadina filled with salad, tuna, truffle oil and stracchino cheese for lunch (with maybe a boiled egg and asparagus if I'm feeling peckish still) and then this pasta for dinner followed by tagliata di tonno, where strips of fresh tuna steak are seared on a white hot grill and often served with sesame seeds, balsamic vinegar and rocket salad (to which I'd add a bit of cacio). Wow such lovely photos! Looks like you had a wonderful time ;) great post! Thanks a lot for sharing this wonderful travel experience with us. I enjoyed admiring your photos.